My Contemporary Indian Mildred Pierce | personal.amy-wong.com - A Blog by Amy Wong. 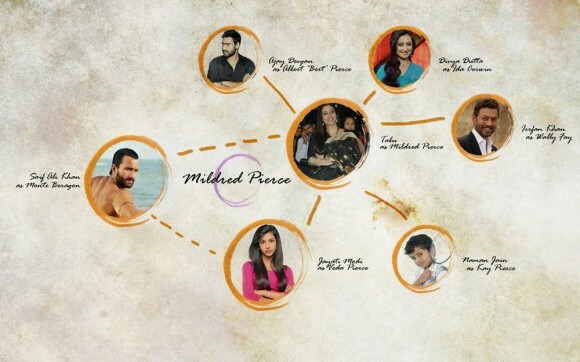 I did my fictional dream cast for my remake of Mildred Pierce set in contemporary India. Right now, just after re-watching Mildred Pierce, I feel it’s perfect. I love it. The movie has to begin with a clustered shot of Tabu surrounded and being hounded by journalists and paparazzi as she enters the police station followed in by Irrfan and Ajay. It’s a wealthy family in a murder scandal, it’d be a media circus everywhere. Early in the morning, the body of Saif was found shot dead in his worn down yet still luxurious penthouse, and the news channels and networks are having a field trip as details of the horrific scene begin leaking from everywhere. First minor change- Kay gets a gender-switch. Tabu and Ajay get an elder daughter in Jayati Modi and a younger son in Naman Jain. Though I’d be afraid to typecast this little boy, I’d like to have him play a male version of Kay who just enjoys being a normal mommy-loving kid with his soft demeanor in contrast to Jayati’s personality, who has been and will continue to be spoiled silly by Tabu. The loss of a son will also reinforce that wanting to overcompensate to her elder daughter as rotten as she might be. I’d like Ajay and Irrfan to still be real estate agents, but I’m not too sure about what the dynamics in the sector are to be able to have Ajay lose his job — or maybe he gets fired for a bad business deal hurting his ego and making it more tense at home with Tabu and the whole ‘he can’t support his family financially so his wife has to work’ business. That leaves Irrfan’s Wally as the cunning businessman who makes deals under the table and gets enough money for the company and himself, which lets him open his own ‘bar’ – you know, those kinda fancy night clubs where you get more than you usually bargain for. As for Saif, he gets to meet Tabu on his own when she herself makes the inquiry for his property. Unable to make a deal, she ropes Irrfan’s character to ensure the money loan. Saif has to be one of them socialites of a really good family (of artists or film people) who has just been happy to just get by with his last name, partying and living it off. He’s not interested in Tabu until he hears the word ‘money loan’ and it’s gotta be super gross when he starts hanging out with Jayati. Because GROSS – a 40 year-old hanging out in clubs with 19-20-somethings. What about Ida, you say? Where does Tabu meet Divya? I don’t exactly know what I want Tabu to be doing, but since she’s a housewife or homemaker, the natural thing to do was to look for a job as a maid in an upscale neighborhood. Defeated one day, she passes by a house where someone is getting lavishly married. There’s ruckus backstage, someone in the catering gets fired – ‘What are you looking at?’ Ta-da! Job in the catering business. Jayati wants to be an actress (maybe she’s 17 instead of 18 or 19) — in a world where name recognition and hits are everything. Does she secretly shoot Saif because he rejects her and mocks her or to be on every newspapers’ headlines across the nation? ‘Food Entrepreneur’s Daughter Booked for Murder’ – what are the laws in India? Would she get judge as an adult? Would Tabu pay for her bail (if there’s bail in that case) or would Tabu continue to move heaven and earth for her preciously evil Jayati?